Jennie, Julie, Josie and Jane were all born on the same day. In fact they were quadruplets. They had the same mom and dad, but none of them looked like the other. 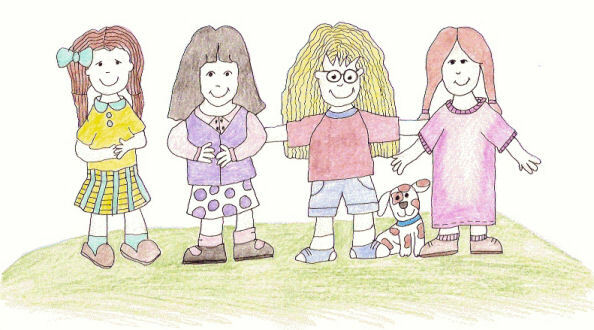 Jennie had long brown hair; Julie’s hair was as black as coal; Josie’s hair was long, blonde and wavy, and Jane’s hair was red. Even though they didn’t look alike, they were the best of friends. They did everything together. Jennie loved to eat ice cream, but didn’t like cabbage. Julie loved to eat carrots, but didn’t like brussel sprouts. Josie loved to eat chocolate cake, but she wouldn’t eat oranges and Jane loved prawns, but wouldn’t touch eggs, especially hard boiled eggs. The one thing they all loved to eat was spaghetti. Every night their mum cooked spaghetti for them because they all liked it. She tried to get them to eat fish, but Jane didn’t like it. She tried to get them to eat meat loaf, but Jennie refused to eat that. She tried to get them to eat curried chicken, but Josie wouldn’t. So, each night she fixed spaghetti. “Mum, it doesn’t have spinach in it, does it?” Julie said. “It doesn’t have crab in it, does it?” Jane made a face of disgust.